← 2013 – The Year of the Stash – Use Those Beautiful Fabrics This Year! 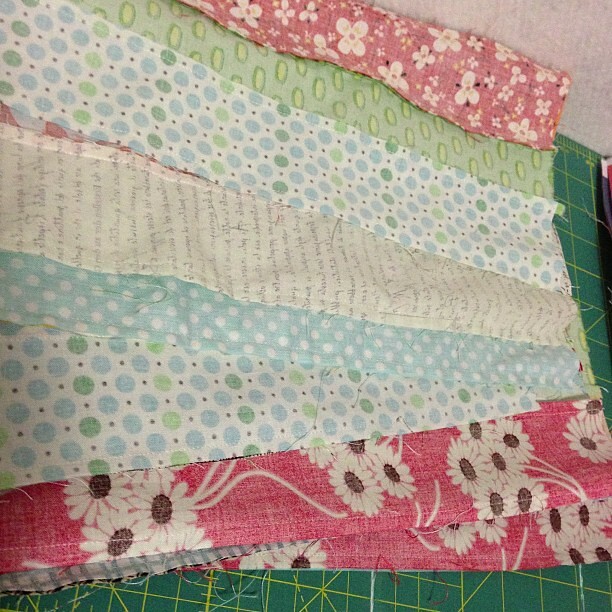 Last night I got another 6 strip sets all sewn up for my Scrappy Trip Along quilt. I didn’t have a whole lot of sewing time but it was nice to see some more progress. I’m totally excited to get this top finished. Especially after seeing Katy’s and Rita’s finished. And wow! there are a lot of amazing quilts being shown off in our Flickr group and on Instagram (search #scrappytripalong). There’s now over 300 people in the Flickr group and over 750 photos with that IG hashtag. Amazing. Seriously, I think that the amount of people who are excited and involved in this quilt along is awesome. Just chatting with a few people it seems that these informal types of quilt alongs are just what people need. I know I get asked several times a week if not daily to have Pink Castle Fabrics sponsor some type of blog hop, or quilt along, or whatever. I don’t think everything out there needs to be some sort of moneymaker or competition. Even those of us who sew/sell fabric for a job still got into this gig because we like sewing! I know I’m not the only one out there who is exhausted and just misses sewing for fun. Katy and I talked about instigating one new informal quilt along each month this year. Something simple and quick and stash/scrap busting. No contest, no deadlines, no strings. Just pop a tag on your smart phone photo of your progress and oogle at others’ beautiful work. What do you think? Are you in? I will have a lot of sewing to show off next week! 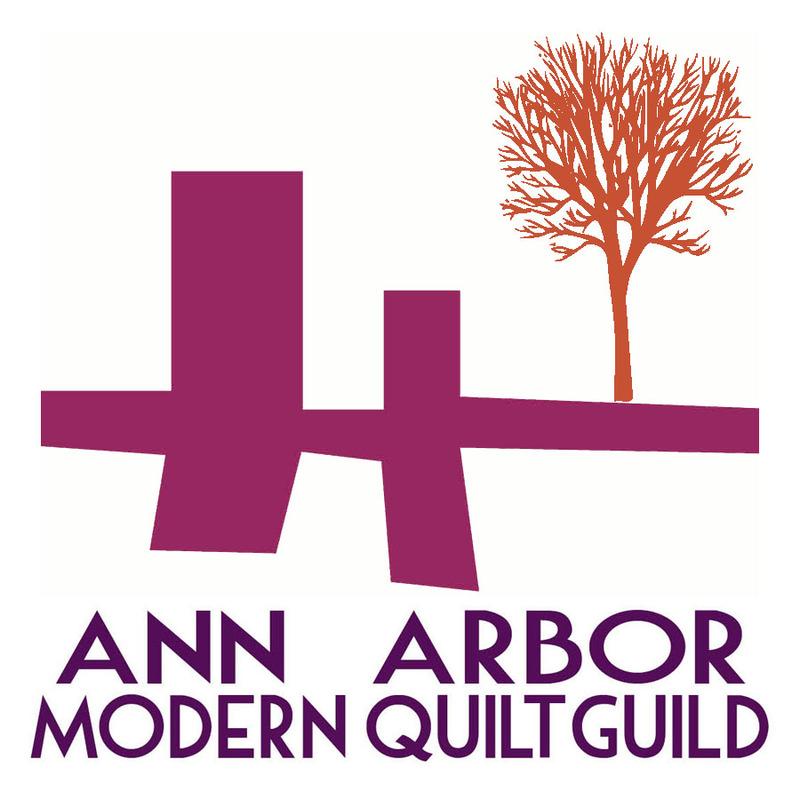 I’m going to a quilting retreat this weekend with the Ann Arbor Modern Quilt Guild! YAY!! This entry was posted in Tutorial, WIP. Bookmark the permalink. Well, darn! I was not going to make one of these quilts, but….they sure are gorgeous, and I went to the flick’r group, and they looked even better! Thanks for doing all the math on how many strips we need to different sizes! Thanks for working out the maths, although the numbers are a bit daunting! 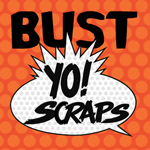 Off to tidy my studio so I can find the scraps I want to start mine! Very keen for fast, stash busting ideas, quilt along thingy! Love the idea about informal quilt alongs! Thank you so much for this! I want to join in (I will join in!!) but I was a little unsure about numbers and all that not so fun stuff about quilting!! I also love the idea of an informal quilt along just for the love of sewing! these quilts are so fun! I love how yours is looking so far. have fun at retreat! I’m totally in for informal fun quilt alongs, maybe even take the pressure off yourselves and host on your blogs but have other’s choose the quilts and do the prep work, but keep all the links and everything in the same place and a single flickr so that later in the year it’s easy for people to pick and choose which quilts to make from one source of inspiration. Although it’s very nice of quilt shops and blogs to arrange giveaways, I rarely enter them – only if it is for something I would really like and would actually use, especially if there are multiple requirements and blogs/fb/twitter’s to follow… It always feels a bit ‘grabby’ to just keep on entering giveaways when I don’t have time to actually engage with the blogs/bloggers on a more personal level. I love the idea of an informal quilt-along. I took a breather from blogging for about a year when I had a baby and when I started up again, in July, I was surprised at how structured it has all become with blog hops, link parties, sew alongs…etc…It’s all fun, but sometimes I just want to sew, to sew! 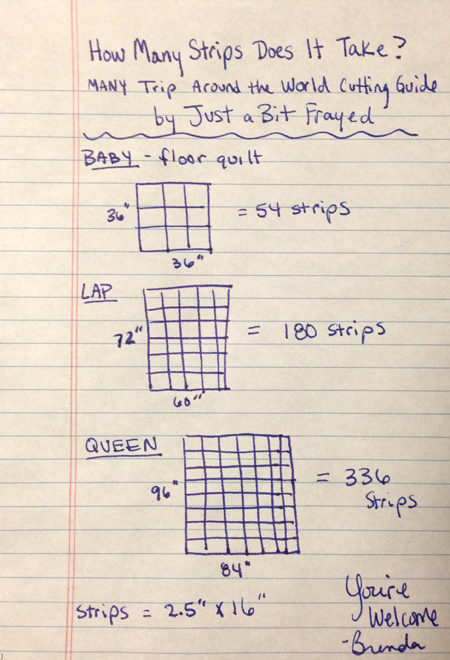 Thanks for the math…I should have done it to start cause what’s slow me down is stopping and cutting more strips! And I love the idea of informal scrap busting quilts. I have been cutting 2 1/2 sq as I cut these strips for a Scrap Vomit, why I haven’t thought about sewing them already as leaders/Enders is beyond me. Happy New Year Brenda! oh this is helpful – thanks so much! Thanks so much for the math!! Really helps. Great group of people, bloggers – for the most part so many sharing, giving, receptive lovely people. Love it! Thank you for the math, I have caught this bug too. Inquiring minds want to know….when you are referring to “strips”, do you mean the 16 inch lengths of width of fabric? Thank you for all your help! Thank you for your maths sheet. Just started cutting 16″ strips last night so now I know how many more I need for a Cot Quilt. Brilliant! So glad I found this! I just started one of these last week and had no idea on how to figure this out.